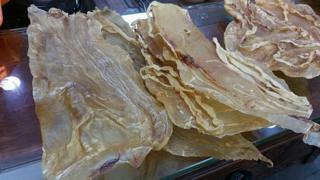 Authorities in China are prosecuting 11 people for smuggling $119m (£90m) worth of fish swim bladders from Mexico. They are accused of bringing in 20,000 swim bladders from totoaba fish from the Gulf of California in Mexico and selling them in China. Swim bladders enable totoaba to maintain their buoyancy in the water. They are used in traditional medicines in China and can fetch up to £15,000 on the black market. Many people believe it can cure ailments such as arthritis. Prosecutors in Guangdong province said the smugglers had been operating for over three years before they were caught. The totoaba is on the International Union for Conservation of Nature's critically endangered list. Numbers of the vaquita marina porpoise, local to the Gulf of California, are in decline with some becoming stuck in fishing nets targeting totoaba. The mammal is now classed as critically endangered. Mexico's navy has been patrolling the Gulf of California to try to deter smugglers. Earlier this year, a record haul of Pangolin scales was discovered inside a shipping container in Hong Kong, with an estimated value of about £6m. Pangolin scales are said to have medicinal value in parts of Asia. Days later, £780,000 worth of rhino horn was also discovered at Hong Kong airport. Last year, China put on hold a plan to lift part of a ban on trading tiger bones and rhino horns following criticism from animal protection groups.